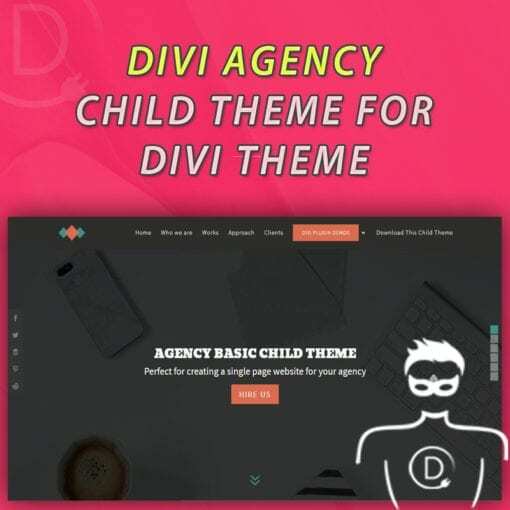 A modern, ‘tumblr’ homepage style child theme for Divi with one page scroll engine. The perfect theme to showcase your photography. 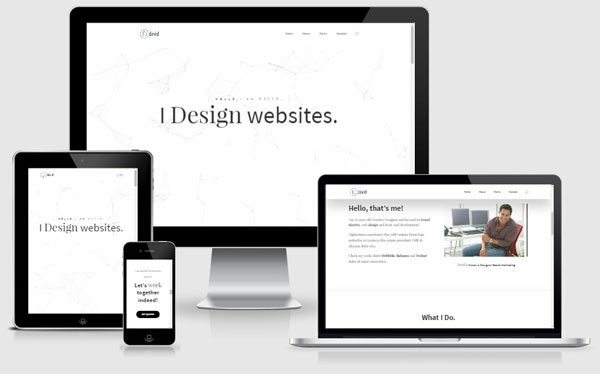 It also a good starting template to build very creative business websites. See a DEMO (click here) of a site created using this child theme by one of our recent customers. This child theme was featured in Elegant Themes Blog as one of the top Divi child themes for Photographers. – Unique control panel which allows you to customize the appearance and functions of the child theme. – You can navigate sections through up and down keys. Its even touch enabled in mobiles. 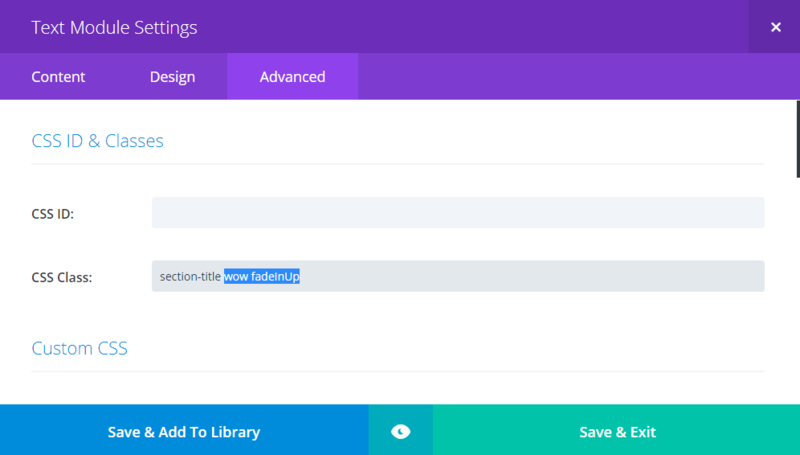 – Divi Visual Builder Support. – Create any number of scroll pages using page templates. – Install free ‘Simple Divi Shortcode’ plugin to use any Divi module inside scrolling pages. – Change scroll side dot navigation position. – Use Divi Theme Default side Dot Navigation instead of the dot navigation style comes with this child theme. – Ability to Remove scrolling effect in small screen sizes. 1. Install the Divi parent theme by Elegant Themes (Divi Scroll works best on version 2.7 and higher. You will also need to have PHP version 5.5 or higher installed in your server). 2. Install and activate the Divi One Page Scrolling child theme. 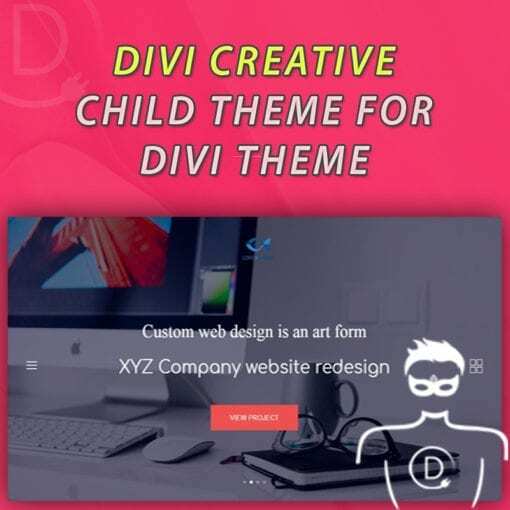 – Upload the Divi-child.zip using the WordPress dashboard, or use FTP and upload the unzipped folder “Divi-child” into your themes directory and activate it. 3. Install and activate “One Click Demo Import” Plugin (You can find ‘Install Plugins’ menu item under Appearance). 4. Go To “Appearance”. Click on “Import Demo Data” and Click on “Import Demo Data” Button. 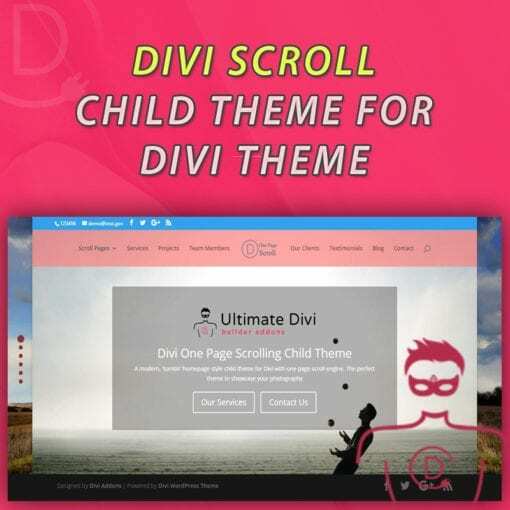 This will import Divi Scroll child theme content into your site. If you see any error please try again. If it doesn’t work ask your host to increase maximum execution time. *** IMPORTANT: It will take some time. So please don’t cancel the process. 5. Go to Appearance > Menus. Assign the menu as the primary menu (if it’s not already set up like that during demo import process). 6. Go to Divi > Theme Options. Click on “Arrow Up / Arrow Down” at the top right and import the .json file (import/Divi Theme Options.json). This will import all Divi Options Settings. *** IMPORTANT: It will take some time. So please don’t cancel process. 7. Go to Divi > Theme Customizer (or Appearance > Customize). Click on “Arrow Up / Arrow Down” at the top left and import the .json file (import/Divi Customizer Settings.json). This will import all Customizer Settings. 8. Go to the home page and assign ‘Child Theme Scroll Page’ as the template. 9. Hover on Divi parent menu and Click on “Child Theme Settings” and Activate “Remove scrolling effect in small screen sizes” option. 10. Go to Permalink Settings and chose “Post name”. 11. Check frontend and enjoy your new child theme! • If you want to add additional sliders to Scroll page simply clone/duplicate a Section Module. Then you can edit the section module and Fullwidth Header module in it. • You can use element animations (In Builder Modules, Theme Templates, and Widgets). UPDATE: Recent Divi update included all these animation effects to the builder so to avoid any potential conflict we recommend you to use those default builder animations instead. You can easily remove wow animation CSS classes by going to ‘Advanced’ tab of ‘Full width header’ module sections in Scroll home page. Then you can configure animations for Full width header sections with Divi builder itself. You can still use our child theme wow animation effects in areas where you can’t use Divi builder like theme template files. • Create any number of scroll pages using page templates. Simply save the home page scroll layout to Divi library. Create a new page and load it. Then you can select a scroll template to apply for this new page. You can convert any Regular or Full width section module into a scrolling section by giving ‘fullpagesection’ CSS class. Do note that the section scrolling works best with Full width section modules. • You can install free ‘Simple Divi Shortcode’ plugin to use any Divi module inside scrolling pages. Just paste the module shortcode in to Fullwidth Header or Code module’s text field. o Go to Divi Library > Add New > Give a name and Select Layout Type as ‘Module’. o Insert and configure the Module you want, in our case its ‘Contact form’ module, and then publish it to Divi library. o In Divi library you need to find the post ID relevant to the layout you just saved by looking at its URL. Check the plugin page for more details on this. You can insert this shortcode in to a text field of one of the existing full width header modules in the page or add it to a new Fullwidth Code module section. To remove this site wide adds this code to stylesheet. If you want to just remove it for a specific scroll page then add this code to Divi builder page settings CSS panel. o Go to the scroll page and activate ‘Dot Navigation’ under ‘Div Page Settings’ Meta box. Version 2: The Visual Builder Edition. * Fixed Flickering error on Google Chrome and bunch of other small fixes. We integrated ‘WoW animation library‘ to this child theme so you can easily animate any Divi Module/Row or Section. Create stunning web pages using these animation classes. You just have to add class “wow” with below classes into Row or Section or a Module. * If you experience problem with slow moving sections when using Blank Page template then please update custom.min.js file in the parent Divi theme with the file we have included in the child theme package. This was a problem caused by latest Divi theme update. We hope they will fix it in next versions. Till then please update this js file in main Divi folder with the one we have included. THIS DO NOT AFFECT NORMAL SCROLL PAGE TEMPLATES – ONLY THE BLANK PAGE TEMPLATE IS AFFECTED. So, you don’t need to update this file in main theme if you don’t plan to use blank page scroll template. This is a neat child theme. I love the full-screen scrolling and the right side menu that opens on hover. This does give it a Tumblr look and feel. I also like being able to use the up and down arrows as navigation through the screens. It uses the WOW animation library so all of the Divi elements can easily be animated. It adds a new control panel called Child Theme Settings where you can select features like opening the right side menu on hover, changing the right menu’s color, hiding the footer, adjusting the dot navigation color, and see how to use the WOW animations. If you’re looking for a Tumblr type of layout and want a child theme with some extra features this one is a great choice.